President Donald Trump told the UN Security Council on Wednesday that there would be consequences on those who fail to comply with U.S. sanctions on Iran in an apparent message to European efforts to save the 2015 nuclear accord. UNSC Unanimously Disagrees with Trump over JCPOA"
US Secretary of State Mike Pompeo has also slammed EU's "counterproductive" measure to bypass US sanctions on Iran. Some other US officials have concurred, although maintaining that there are no details available yet to examine the EU plan's efficiency. Pompeo was referring to EU's plans for a "special purpose vehicle" (SPV) designed to circumvent U.S. sanctions against Iran's oil exports, which are part of the sanctions to be re-introduced by the U.S. on November 4 alongside other sanctions on Tehran's international banking operations. The plan had been originally ruled out by the media and diplomas at the UN General Assembly in New York as vague and non-practical when it was announced by EU Foreign Policy Chief Federica Mogherini and Iran's Foreign Minister Mohammad Javad Zarif after a meeting between Iran and the remaining parties to the nuclear deal on Monday, September 24. The vaguely defined plan must have alarmed US officials including Pompeo who said during a speech at a New York conference Tuesday evening, "Unfortunately, just last night I was disturbed and indeed deeply disappointed to hear remaining parties in the Iran (nuclear) deal announce they are setting up a special payment system to bypass U.S. sanctions." He added: "This is one of the most counterproductive measures imaginable for regional global peace and security." Speaking at the same conference, U.S. National Security Adviser John Bolton mocked the EU for the plan's "lack of specifics." "The European Union is strong on rhetoric and weak on follow-through," he said. "We will be watching the development of this structure that doesn't exist yet and has no target date to be created. We do not intend to allow our sanctions to be evaded by Europe or anybody else." Bolton said the United States will be "aggressive and unwavering" in enforcing its sanctions. Meanwhile, German Foreign Minister Heiko Maas told reporters there is "strong unity" between Europe and Iran on minimizing the impact of U.S. sanctions. However, European governments have so far failed to convince European companies working with Iran not to leave the country. While the situation remains still unclear, Iran has been working hard to reduce the effect of renewed sanctions on oil exports and banking operations. Iranian Supreme Leader's top adviser Ali Akbar Velayati said in Tehran on Tuesday that Iran is not worried about how to collect its oil revenues. "We no longer need the dollar," he said, adding that thanks to his negotiations with the leaders of Russia, China and India, "Iran will be paid in the Chinese, Russian and Indian currencies" for its oil exports. This comes while India has said it will stop purchasing oil from Iran at least during November. Meanwhile, Iran's oil money was frozen in several countries including China, India and Japan during the past round of US sanctions on Tehran's international banking. 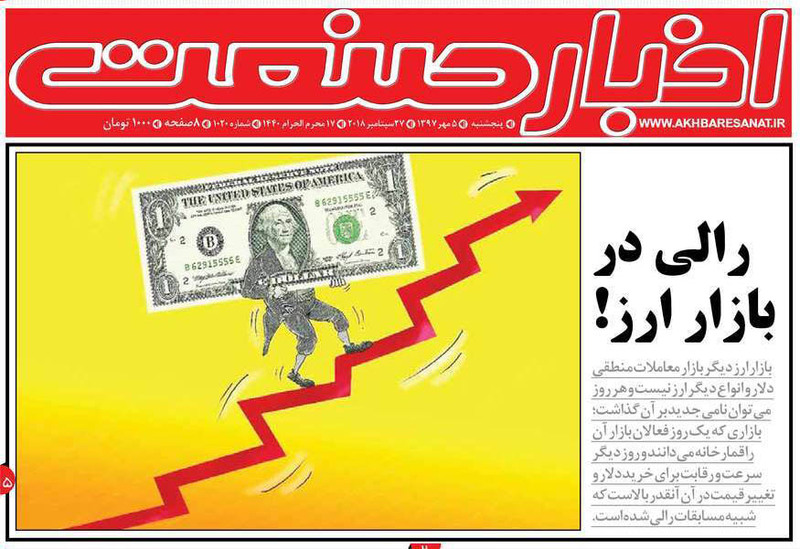 Whatever the outcome of EU's measures and how the US is going to counter them, the impact on Iran's economy has been devastating, as the rate of exchange of US dollar jumped from 0ver 160,000 rials per dollar Tuesday morning to around 185,000 rials on Wednesday. 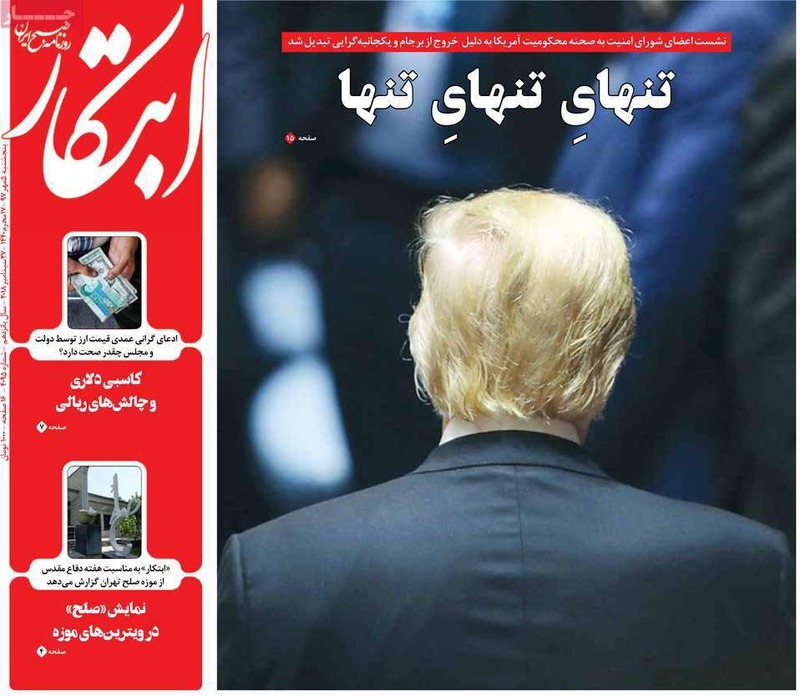 Reports and videos on social media say there has been a demonstration in Tehran at the main cell phone market "Alaeddin," where hundreds of angry businessmen chanted the slogan "We don't want dollars at 200,000 rials," fearing that the rate of exchange for the US dollar would rise further as President Donald Trump is slated to lead a UN Security Council meeting later on Wednesday.